TEM image of DLC tip. 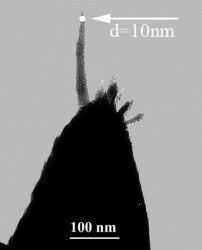 Super sharp diamond-like carbon (DLC) tips* with typical curvature radius 1nm are extremely useful for obtaining high resolution on objects with sizes of several nanometers. DLC tips have very long lifetime due to the high material durability. DLC tips can be grown on any standard probe series. To guarantee 20 nm working length of DLC tips TEM is used. 10% from total number of probes in the batch are selected for testing. At least 80% of those probes should have the only DLC tip which lengh is exceeded by 20 nm others DLC tips on the same probe. In this case the whole batch is considered as passed the TEM test. On the surfaces with roughness bigger than 20 nm double images are possible. Curvature radius - 1-3 nm. SPM image of DNA deposited on HOPG is obtained by DLC tip. DNA size (2-2.5 nm) is nearly equal to the real size (~2 nm)! Standard probes provide DNA imaging with size about 10-15 nm. SPM image of linearized plasmid DNA deposited on the modified HOPG obtained by DLC tip on the Solver P47 BIO (NT-MDT Spectrum Instruments) by Dr.Dmitry Klinov, Institut of Bioorganic Chemistry, Russian Academy of Science. * "Dmitry Klinov and Sergei Magonov, True molecular resolution in tapping-mode atomic force microscopy with high-resolution probes, Applied physics letters, 84 (14), (2004) 2697-2699."